Are you a DIY kind of person? If so, this ones for you! There is zero need for chemicals to get powerful stain removal. Every chemical we lay down on our floors, counters AND clothing has an effect on our health. 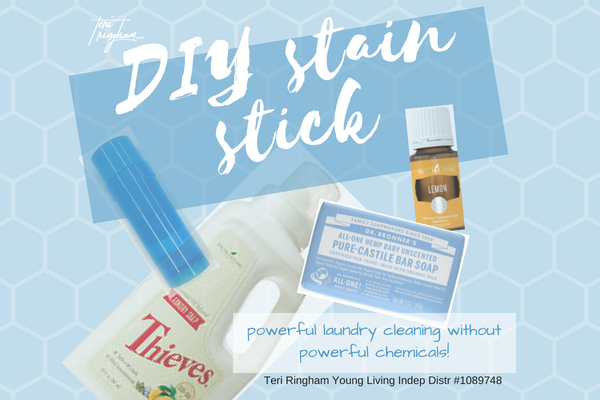 Why not make a powerful yet chemical free stain stick? The powerful essential oils of Clove, Cinnamon, Lemon, Eucalyptus and Rosemary (in Thieves laundry detergent) is fabulous for breaking down the enzymes in a stain that normally make them difficult to remove. The “bump” of extra power with more Lemon oil makes this especially effective. Grab your saucepan and let’s get started! Cut the corner on the Ziplock and squeeze your mixture into your empty deodorant and lip balm (stain stick) containers. Once cooled, add lids to your containers and your are set! Dampen your stain stick slightly with a wet cloth prior to each use to help it spread more evenly over the fabric prior to washing. Your stain stick can be used on furniture, car upholstery, carpet…anywhere you need to remove stains. Remember, with any new product, it’s a good idea to do a test spot first. Find castile bar soap here.